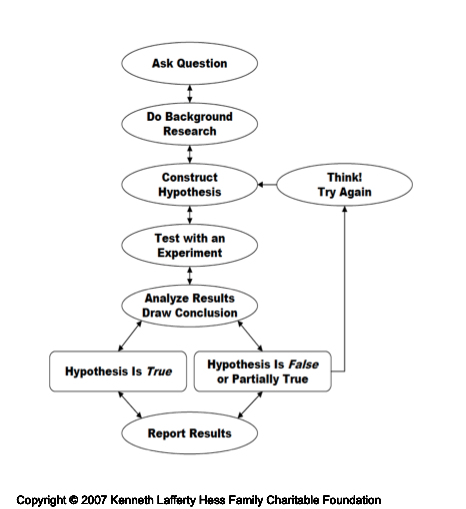 A simple guide to how science works. “If it disagrees with experiment it’s wrong. You fall in love with a subject. You immerse yourself in your chosen subject, spending a few years reading all of the research that has ever been done in it. You go to conferences where you hear about what other people in your field have been doing, and you talk to them about what you’re doing. You share ideas. You begin to observe some patterns, develop some ideas of your own about how your subject works. Questions about your subject that have never been answered occur to you. You think hard about whether they’re good questions, and ask advice from more experienced people in your field. You come up with testable ideas (called hypotheses), figure out experiments to test them, and what kind of data you need to in order to prove if they’re wrong. Then you do the experiments. You think hard about the results you get. You repeat the experiments if you can. You do other experiments to see if you can disprove the results from the first experiments. You take your work to a conference and see what other experts think about it. Based on their feedback, you decide to publish your results and how you interpret them. You write up the whole process: questions, hypotheses, experimental design, results, and your interpretations of the results. You send it to a journal in your field. The journal editor decides whether the paper is appropriate for the journal, and then contacts experts who specialize in the same field. These experts anonymously review the paper, decide whether the study is well designed, the results are valid, and the interpretation of the results is reasonable. If they decide that it’s acceptable, the paper is published. If not, the paper is rejected. If your paper is published, your data are available to the rest of the scientific community. They may do the same experiments as you did, trying to replicate your findings. If they can’t replicate your data, or find problems with your interpretation, new ideas may take the place of yours. If they are able replicate your results and they stand the test of time, they may be used as a starting point for a new level of questions. Here is a much more detailed (and very useful) description of how research is done. Working in science requires that you are comfortable with uncertainty and doubt. Because the process of science is about disproving things, your own hypotheses can be disproven at any time. But this is why the scientific method is so powerful: it’s a type of inquiry that builds upon itself while being self-critical at the same time. It’s not perfect by any means, but it is, most importantly, effective. It works. This is not to say that other ways of knowing about things (religiously, traditionally, intuitively) are wrong in themselves. But by definition they are not effective or useful for knowing things about the natural world, which operates according to physical principles. It’s fine if a person has other sources of knowledge, but it’s not fine to take advantage of the respect accorded to scientific knowledge and mislead people by trying to pass off non-scientific ideas as scientific. Fortunately, it’s fairly easy to recognize when this is happening if you know what to look for. I’ll write about this in my next post.